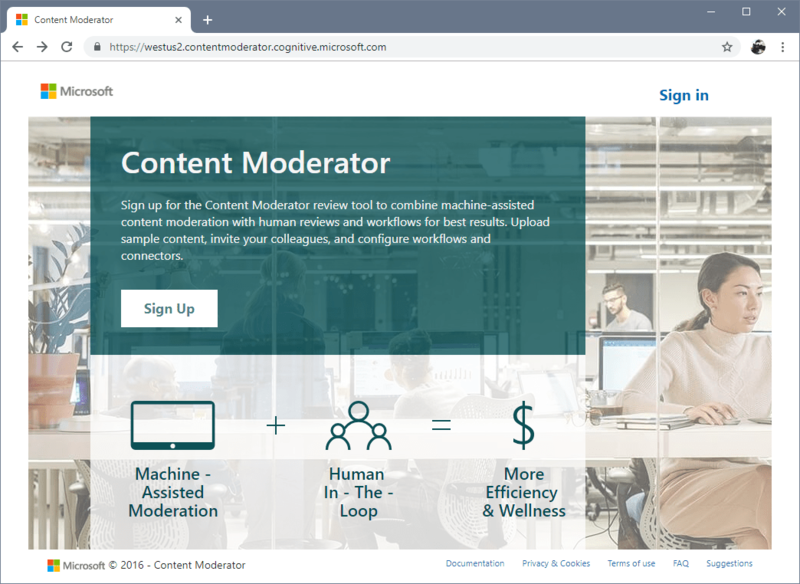 什么是 Azure 内容审查器？What is Azure Content Moderator? Azure 内容审查器 API 是一项认知服务，用于检查文本、图像和视频中是否存在可能的冒犯性内容、危险内容或其他令人不适的内容。The Azure Content Moderator API is a cognitive service that checks text, image, and video content for material that is potentially offensive, risky, or otherwise undesirable. 找到此类内容时，此服务会将相应的标签（标记）应用到该内容。When such material is found, the service applies appropriate labels (flags) to the content. 然后，应用会处理标记的内容，使之符合法规的要求，或者为用户维持一个理想的环境。Your app can then handle flagged content in order to comply with regulations or maintain the intended environment for users. 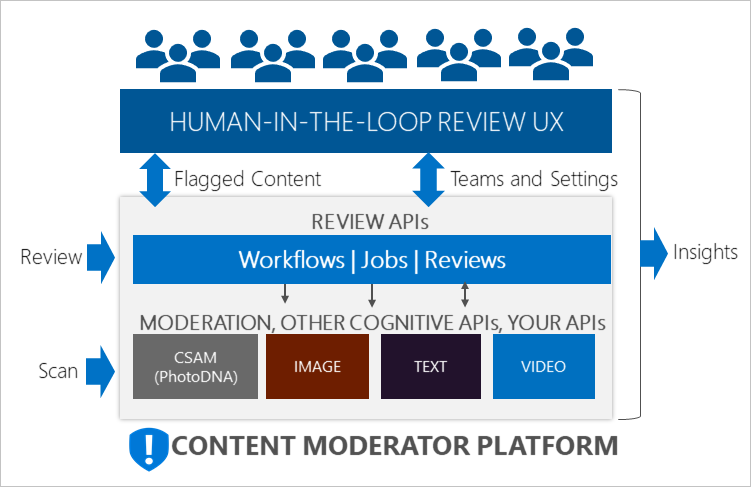 请参阅内容审查器 API 部分，详细了解不同内容标记表示的意思。See the Content Moderator APIs section to learn more about what the different content flags indicate. 内容审查器服务包含多个可以通过 REST 调用和 .NET SDK 使用的 Web 服务 API。The Content Moderator service consists of several web service APIs available through both REST calls and a .NET SDK. 它还包括人工审阅工具，让审核人员来协助服务改进或优化其审查功能。It also includes the human review tool, which allows human reviewers to aid the service and improve or fine-tune its moderation function. 内容审查器服务包括适用于以下方案的 API。The Content Moderator service includes APIs for the following scenarios. 文本审查Text moderation 扫描文本中是否存在冒犯性内容、明确的或暗示性的色情内容、不雅内容和个人数据。Scans text for offensive content, sexually explicit or suggestive content, profanity, and personal data. 自定义术语列表Custom term lists 扫描文本中是否存在内置的术语和一系列的自定义术语。Scans text against a custom list of terms in addition to the built-in terms. 根据你自己的内容策略，使用自定义列表阻止或允许内容。Use custom lists to block or allow content according to your own content policies. 图像审查Image moderation 扫描图像中是否存在成人内容或不雅内容，通过光学字符识别 (OCR) 功能检测图像中的文本，以及检测人脸。Scans images for adult or racy content, detects text in images with the Optical Character Recognition (OCR) capability, and detects faces. 自定义图像列表Custom image lists 针对自定义图像列表对图像进行扫描。Scans images against a custom list of images. 使用自定义图像列表筛选掉常常反复出现的内容的实例，这些实例不需再次分类。Use custom image lists to filter out instances of commonly recurring content that you don't want to classify again. 视频审查Video moderation 扫描视频中是否存在成人内容或挑逗性内容，并针对上述内容返回时间标记。Scans videos for adult or racy content and returns time markers for said content. 审阅 APIReview APIs 使用作业、审阅和工作流操作在人工审阅工具中创建和自动执行人工干预工作流。Use the Jobs, Reviews, and Workflow operations to create and automate human-in-the-loop workflows with the human review tool. 尚无法在 .NET SDK 中使用工作流 API。The Workflow API is not yet available in the .NET SDK. 内容审查器服务还包括基于 Web 的审阅工具，其中托管的内容审阅可供审阅人处理。The Content Moderator service also includes the web-based Review tool, which hosts the content reviews for human moderators to process. 人工输入不会训练服务，但是将服务与人工审阅团队组合起来以后，开发人员就可以在效率和准确性之间取得适当的平衡。The human input does not train the service, but the combined work of the service and human review teams allows developers to strike the right balance between efficiency and accuracy. 审阅工具还为各种内容审查器资源提供用户友好型前端。The Review tool also provides a user-friendly front-end for a variety of Content Moderator resources. 与所有认知服务一样，使用内容审查器服务的开发人员应该了解 Microsoft 针对客户数据的政策。As with all of the Cognitive Services, developers using the Content Moderator service should be aware of Microsoft's policies on customer data. 请参阅 Microsoft 信任中心上的“认知服务”页面来了解详细信息。See the Cognitive Services page on the Microsoft Trust Center to learn more. 按照在 Web 上试用内容审查器中的说明开始使用内容审查器服务。Get started using the Content Moderator service by following the instructions in Try Content Moderator on the web.